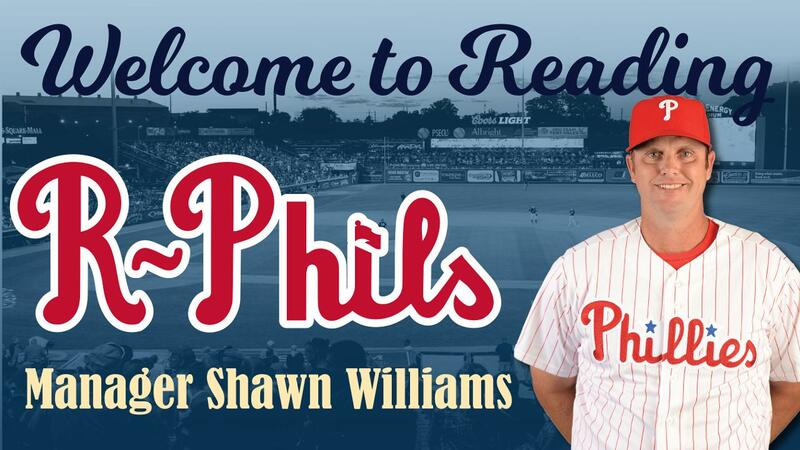 Former Clearwater Threshers manager Shawn Williams will be the R-Phils new manager for the 2019 season as announced by Josh Bonifay, Philadelphia Phillies Director, Player Development on Friday. Williams will be joined by returning hitting coach Kevin Riggs, as well as new Fightins pitching coach Aaron Fultz, assistant coach Nelson Prada , athletic trainer Michael Hefta, and strength and conditioning coach Kenny Matanane. Williams takes over in Reading after guiding the Clearwater Threshers the past two seasons. In 2018, the Threshers won the second-half title in the Florida State League North Division. Over the past two seasons, Williams led the Threshers to a 144-131 record. Prior to his time in Clearwater, Williams also managed in Lakewood (A) for two seasons (2015-2016). He joined the Phillies player developmental staff in 2014 as a manager for Williamsport (A). Williams spent the month of April as a fill-in bullpen catcher and also served as a player/coach for Williamsport in 2013. He spent four seasons in the Tampa Bay Rays minor league system as a utility player from 2007-2010. His father, Jimy Williams, managed the Houston Astros and Boston Red Sox, and was the Phillies bench coach for two years (2007-2008). He was named the American League Manager of the Year in 1999. Kevin Riggs will be entering his second season as hitting coach for the R-Phils. He joined the Phillies organization in 2018 and came from the Altoona Curve (AA) of the Pittsburgh Pirates where he was their hitting coach for three seasons (2015-2017). Prior to that, Riggs began his coaching career with Casper (R) in 2007. He also made stops in Asheville (Class-A) and Modesto (Class A-Advanced). He served as manager for the Tulsa Drillers for two seasons (2013-2014) where he compiled a 139-138 record and made it to the league finals in 2014. Aaron Fultz joins the Reading staff as pitching coach for his first season. Fultz follows Williams from Clearwater, where he served as pitching coach the past three seasons. Fultz was previously the pitching coach for Williamsport (A) in 2012 and 2014, and Lakewood (A) in 2013 and 2015. He pitched in the Major Leagues for the San Francisco Giants (2000-2002), Texas Rangers (2003), Minnesota Twins (2004), Phillies (2005-2006) and Cleveland Indians (2007). The former big-league lefty was a member of the 2002 National League Champions and pitched in eight total playoff games between the Giants and Indians. He went 7-1 with a 3.38 ERA in 128 games over his two seasons in Philadelphia. Nelson Prada joins the Reading staff as an assistant coach for his first season. Prada will be entering his seventh season on the Phillies player development staff. Prada joined the Phillies in 2013, when he became manager of Williamsport (A). He managed Clearwater (A+) in 2014, then joined Lakewood (A) for three years (2015-2017) as a coach before rejoining the managerial ranks for 2018 with the GCL West (R) team. Prior to his time with the Phillies, Prada played and managed within the Minnesota Twins organization (1995-2012). Michael Hefta joins Williams and Fultz from Clearwater for his first season in Reading as Athletic Trainer. The 2019 season will be Hefta's sixth in professional baseball. He spent the past two seasons in Clearwater, and his first three seasons with Williamsport (A). He obtained his Bachelor of Science degree in athletic training from Henderson State University. Kenny Matanane returns to Reading after spending the 2018 season as Strength and Conditioning Coach for the Clearwater Threshers (A+). He was previously with the R-Phils for the 2016 and 2017 seasons. Matanane joined the Phillies prior to the 2015 season. He spent his first season with Lakewood (A) in 2015 before moving up to Reading. Before joining the Phillies, he worked three years (2012-2014) as the assistant strength and conditioning coach for Washington State University, where he also worked in 2007. He spent three seasons with the Seattle Seahawks from 2008-2010 as the assistant strength and conditioning coach. Matanane earned his MS degree in exercise science in 2007 at Central Washington University.